Since January, I've been thinking about adding essential oils back into my hair regimen. When I first began my natural hair journey, I would always add some peppermint and tea tree oil to my homemade hair butters and oil mixes. But once I started buying my products, my need for butters and oils, as well as essential oils, were no longer there. Even though I've done well with store bought products, I knew that essential oils could still be used in various places in my regimen, specifically, my coconut and grapeseed oil mix. 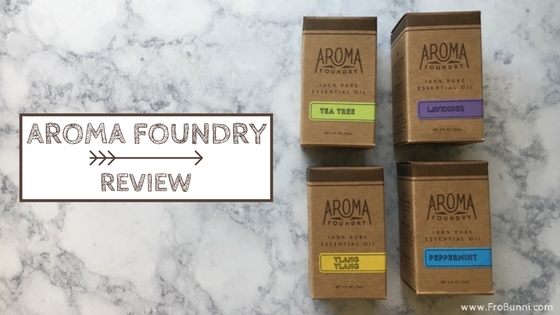 Being so busy with work, yoga, and just life,in general, I totally forgot about trying them...until Aroma Foundry contacted me. When I originally began buying essential oils, I would look on Amazon for the cheapest option available. I assumed these oils were of good quality, but honestly, I wasn't sure. With Aroma Foundry, the quality is guaranteed. All of their essential oils are sourced from the respective oils' countries of origin, as well as a verified supply chain and environmentally conscious packaging. I was sent tea tree, peppermint, lavender, and ylang ylang essential oils. The packaging has a streamlined and clean design, and everything is easily identifiable (I remember sometimes when I would buy oils from Amazon, there was no packaging at all). I decided to try the peppermint oil first, and added about 10 drops into a 6 ounce applicator bottle of oil...big mistake. While that amount was necessary when I was using oils from Amazon, because of the quality of the Aroma Foundry oils, it was too much. I only needed a drop or two drops (I ended up using the rest of the oil for a hot oil treatment before washing my hair so that I wouldn't walk around smelling like an after dinner mint). After trying the peppermint oil, I decided to try the ylang ylang. 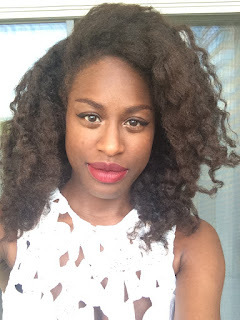 I added it to some coconut oil, and applied it to my hair, and omg! My hair smelled so good, and it felt softer than usual. Since it was my first time using ylang ylang, I did some research and learned that it actually helps to soften hair. A week later, I decided to mix a drop of lavender and a drop of tea tree oil in some coconut oil, apply it to my scalp, give myself a 10 minute scalp massage, and leave the oil on overnight before washing in the morning. Sometimes my scalp can get sensitive and itchy, but after the scalp massage it felt very soothed. And my hair also felt soft, but still strong. Since I've used those oils before, I knew they would be good for this purpose, but because of the quality, I was able to use a lot less than previously. All in all, these oils are amazing. If you're used to buying essential oils on Amazon, these are the real deal when it comes to quality, and even though they're more expensive, they're going to last a lot longer. You only need a drop or two in a 6 ounce bottle of oil. They have a variety of oils, and free shipping for orders over $75 in the U.S. I'll be honest and say that I can't see lavender and tea tree oil having a purpose in my current hair care regimen. But I really do miss the nice tingle of peppermint oil on my scalp, and it has become the perfect way to wake myself up for an early morning yoga practice. And the ylang ylang, this is literally one of the most beautiful smells, I will definitely get it again.